Two guys in the field were disappointed their gear wasn’t up to the hardworking standards their dangerous jobs demanded. Frustration begat inspiration and they decided to try their own hand in business. The lifelong friends and former soldiers knew they could — and would — do better. 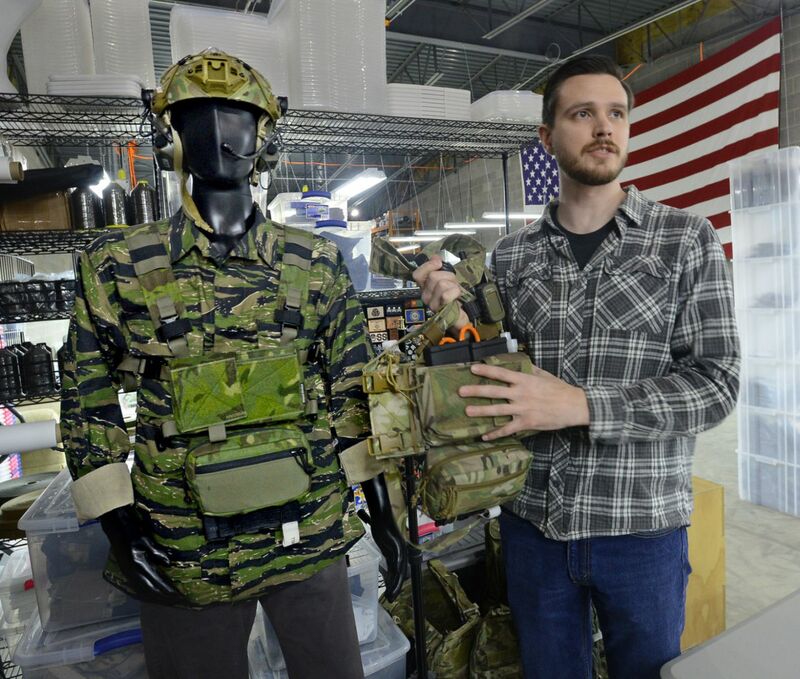 Aberdeen-based Spiritus Systems creates nylon tactical gear primarily for law enforcement and military clients across the country, the brainchild of partners Zane Vogel, Adam Holroyd and his wife, Nichole Holroyd. Their best seller is the micro fight chest rig, a completely modular system that can be adjusted for right or left-hand users, with or without body armor underneath. So popular are their products that Spiritus is in the process of doubling its work space after less than a year at its present location off N.C. 5. In December, the Aberdeen Town Board unanimously approved a permit to allow the company to expand its operations to a separate adjoining parcel. The combined space means the company can hire more staff and stock more inventory. North Carolina has a rich history in the textile industry but the economic recession and global competition hurt many businesses. However, Vogel sees plenty of promise and possibility for the future. “The textile industry that is still in this country, and especially in this state, is very impressive. That is one of the reasons we chose to locate here,” he said. Importantly, everything Spiritus produces is compliant with the Berry Amendment, which prohibits the Department of Defense from buying clothing, fabrics, fibers and yarns that are not grown, reprocessed, reused or produced in the United States. Together with the Kissell Amendment and the Buy American Act, which requires the federal government to buy domestic articles, materials and supplies, primarily to protect American workers and manufacturing jobs, the Berry Amendment protects the viability of the American textile industry. Vogel also points to the company’s investment in state-of-the-art technology to create efficiency and maintain consistency. Automated cutting machines offer precision, and Spiritus is one of the first manufacturers in the state to utilize the Juki line of intelligent sewing machines. Vogel said the business was founded on frustration. He and Holroyd had grown up together, knowing each since grade school, and as adults both experienced equipment failure during their military service. From chest rigs to duffle bags that were issued or purchased individually, they had problems with the quality of their gear. “You should not have catastrophic equipment failure when you are in an austere environment,” Vogel said. They dreamed up Spiritus Systems in 2014 — a name inspired by Holroyd’s call sign — while they were both deployed in Afghanistan. Once the friends left active duty in 2016, Vogel said they finally had time “to turn up the volume” on their manufacturing efforts. Now with the recent expansion into the adjoining space, Vogel said they will be adding staff and are particularly interested in hiring experienced sewers. Spiritus plans to launch several new products next year and Vogel said they are pleased to be part of the new manufacturing revitalization that is underway in the state. “A lot of the manufacturing industry is coming back to the American South. That is something we see very clearly,” he said. Unlike days past, he said manufacturing jobs no longer mean working in a dark, dank factory. Instead he said companies, like Spiritus, provide workers with a climate-controlled environment working with modern machines and new technologies. For more information about Spiritus Systems, visit www.spiritussystems.com.